This is actually the first book that I have had the pleasure of reading from Carina Press and to say that I am pleased with the quality of their authors is an understatement. Carina Press is an e-book division of Harlequin books and the care they taken with the books shines thru. 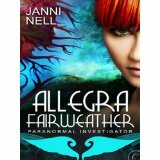 ALLEGRA FAIRWEATHER: PARANORMAL INVESTIGATOR is a book that will grab you from the very first page. Allegra is a heroine that shows no fear even when she goes into dangerous situations. Of course, it does help that she has a beyond hot guardian angel, Casper. After meeting him, I am really bummed out that I also don't have one assigned to me. Ms Nell does a fantastic of job characterizations on both her main and her secondary characters. They all just jump off the pages to come join you in your living room. As you can tell, I really enjoyed this book and am crossing my fingers that this is the start of a great series. I rate this book a 4.2. I received this book compliments of netGallery in exchange for a review. No money changed hands and the opinions are entirely my own.